LGX Module System allows to manage and extend optical node of optical networks. 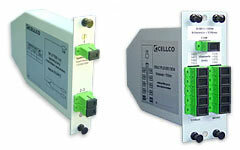 Conformity with the standard 3U/19"(modules) and 4U 19” (chassis) allows to integrate them easily with existing elements of optical network. Maximum 12 modules can be put into one bo. NEPTUN 3U is a 19" patchpanel designed for easy organization of optical fibers, thanks to the use of modular cassettes.